In a unique twist to the very serious issue of puppy mills in the United States, two puppy mill survivors, Harley and Teddy, will be on the road this weekend with a team from National Mill Dog Rescue to save puppy mill dogs. COLORADO SPRINGS, Colo. - Oct. 30, 2014 - PRLog -- It's a bird. It's a plane. No, it's two tiny Chihuahuas saving dogs from puppy mills! 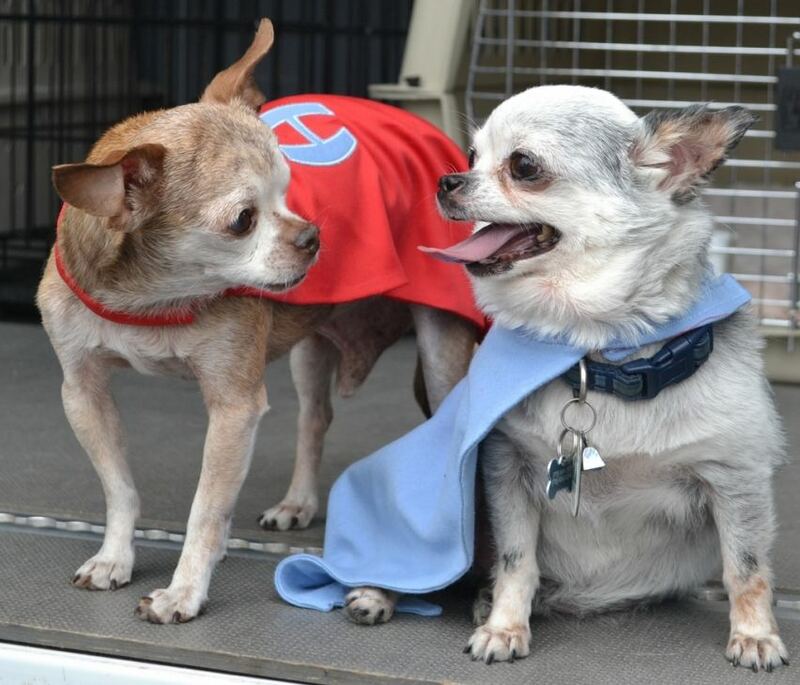 Once again, two puppy mill survivors, Harley and Teddy, are traveling through the Midwest with 'Harley to the Rescue' to save dogs from puppy mills with National Mill Dog Rescue. They are leaving on Oct 31st on yet another rescue trip through the Midwest, planning to save more than 60 dogs. Harley, a 13 year old Chihuahua and an iconic figure in the world of puppy mill awareness through social media, spent 10 years as a commercial breeder in a puppy mill. His one-eyed, grizzled image is immediately recognizable, due primarily to the fact he lost an eye being power washed at the puppy mill. Although suffering with a heart condition, he actively uses his Facebook page with 56,000+ followers to spread awareness about the cruel realities of puppy mills. Teddy, a newcomer to the social media world, lived his first 7 years in a puppy mill and was rescued from his cage a year ago. As Harley's 'Team Driver', Teddy uses his page with 20,000+ followers to spread puppy mill awareness and share his experiences of learning about life outside the cage. 'Harley to the Rescue' started out as a campaign to raise the $2,500 needed to fund one rescue of approximately 25-30 dogs. To date, these two dogs have raised over $500,000 to rescue 418 dogs from the horrific conditions in puppy mills, including covering all their medical expense. Through their facebook pages, they chronicle their journey into the world of puppy mills, all from the perspective of puppy mill survivors. DOGS SAVING DOGS! Follow the mission of these 'caped crusaders' and support their cause!